G’Day Stu, you’ve come a long way in those 10 years. Well done mate. Happy 10th birthday. Congratulations on 10 years of informative blogging. There maybe 1000s of bloggers out there on woodworking but it is very much a case of sorting the wheat from the chaff, and we know good wheat when we see it. On iterations of workshops, I found that interesting because I moved just over two years ago and arrived at a new build property with no garage, workshop or shed. I lie, the developer left what he called a 6′ by 8′ shed that obviously was thrown together and sold through one of the big box outfits. That has been renovated and is now used for garden tool storage. My main workshop is 16′ by 12′ and in 21 months I have reorganised the layout four times and see the fifth approaching fast as I change out machines. So how long before you move it all around? Stu … well done Mate. We all appreciate and understand how life dictates what we can do and when. I am sure you have a huge contingent of followers just like me, who are so very much like you. Still we sit here passively, feeling connected through your great web site and watch you share you experiences in the shed so generously. It is fantastic how you put yourself out there for our benefit and I for one am grateful for your generosity. Perhaps in the next 10 years we can all help you with some content and get more involved. In the meantime, I for look forward to your next tip or adventure with wood. Well done Stu, ten years is a long time to keep a blog going. There are many ghost blogs that just sit there after a few posts. I have enjoyed many of your posts and even met you at a woodworking show.keep up the good work. A blog is like a public diary and you and all of us can look back at what you have achieved. Not forgetting what is to come . Yes Berniesr, I have one of those ghost blogs! Thanks Stu for sharing all the pics of your shed progression over the years. I’ve been through a similar journey with sheds, started in a 3mx3m. Only now I’m moving back to my last one 6×4.5m, a bit smaller than the one I’m renting now so I think it’s time to expand the old one again. I also have a small 3x3m behind for my Triton timber racks which I need to put back in after I’ve installed insulation on the walls and roof. I’m thinking of cutting a door through to join them both. Just trying to figure out if the loss of wall space in both sheds will be worth it. Means I won’t have to walk around in the rain to get timber into the workshop. Thanks Stu for sharing posts over the past 10 years, keep it up. I remember when your site looked like that, I remember thinking you worked for Triton at the time and I remember reading about the Triton dust bucket mod. That might be one of the first times I read your blog. I turned mine into a Cyclone and am still using it to this day for dust extraction. Love the Wayback machine. Your first site doesn’t look too bad at all, I remember it looking like that. My site was much more simple at that stage, I started it in 2004 and was using Godaddy’s onsite builder back then. I don’t think anyone had even heard of WordPress, it was still in its infancy. If only I’d hung in there a bit longer before starting I could have learned WordPress a long time a go instead of trying to play catch up today. 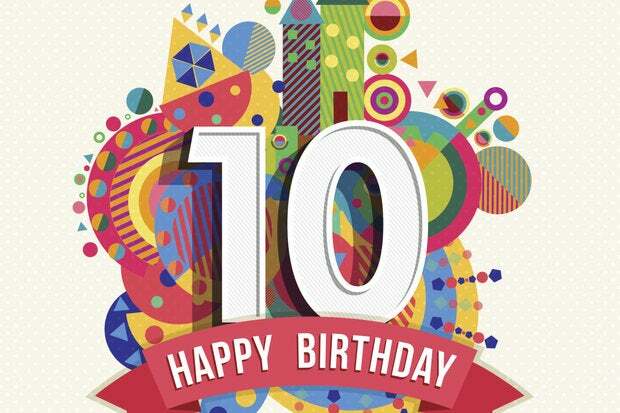 Thanks for all your time you have donated to woodworkers over the years and congratulations – 10 years! No wonder I’m getting grey hairs these days. Is this the end of Stu’s Shed??? no post since April 2017?? ?